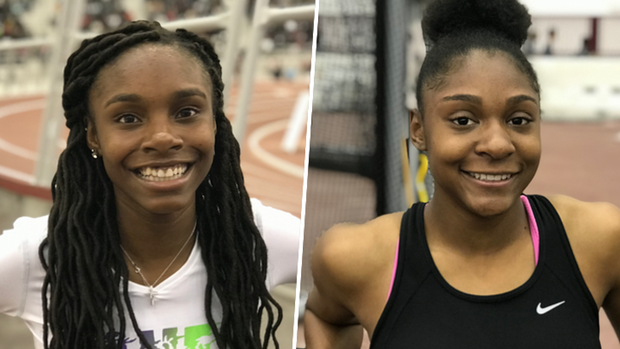 Over the weekend, at the Texas Tech Under Armour High School Classic, Fort Bend Bush sprinter Laila Owens and DeSoto's Jayla Hollis demonstrated how prepared they are for the 2019 season. The two juniors put themselves in elite company with their performances. Hollis, had already run a 23.91 at the Texas A&M High School Indoor Classic, on January 5 was ranked #2 in the nation coming into the meet. She improved on that by running an outstanding 200m preliminary time by going 23.63. She ran another sub 24 second 200m with her finals time of 23.88 for her fourth sub 24 time of the year. Owens already holds the state's fastest 400m time with her Texas A&M performance of 54.76, upped that and added another state leading performance. In the 200m finals at Tech, she blazed to a 23.54 in the for the meet win. As impressive as that is for both ladies, what they have done is bigger than just state leading performances for this indoor season. Owens is currently ranked #1 in the nation and Hollis is #3 in the 200m. But, wait, there's more. Their times from this weekend carry more weight than top national times for this season and this year. The aftermath of this weekend moves them into rare air. They are currently ranked #15 All-Time (Owens) and #18 All-Time (Hollis) on the National All-Time indoor 200m list. That also makes them the second and third fastest girls in Texas history at the indoor 200m distance behind Killeen's Tiffany Townsend who ran 23.34 in 2007. Townsend ran her mark at the National Scholastic Indoor Championships (NSIC) now the New Balance Nationals Indoor (NBNI). There are two more points to factor when considering how impressive Owens and Hollis' performances were. First, Townsend's race was in mid March as a senior against the nation's best. Owens and Hollis are both just juniors and ran theirs in mid January against only Texans. The second point, is that the 200m may not even be the primary event for either of the young ladies. Owens' focus and best performances throughout her career has been in the 400m. The 200m is/was more of a complimentary race to improve her primary race. For Hollis, perhaps her primary race is the 60m/100m hurdles. Through much of her HS career, she has been running superb times over the barriers along with the sprints. Check out the list below to see where Owens and Hollis sit on the girls indoor 200m All-Time National Rankings.